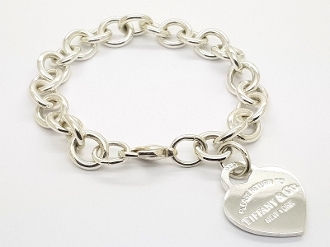 Hallmarks: “PLEASE RETURN TO TIFFANY & Co. NEW YORK” “925” “©️TIFFANY & CO. 925"
Condition:Mint estate condition, shows minimal signs of wear. Professionally polished prior to listing, like brand new (See Detailed Pictures), acquired from original owner. Does not include any Tiffany and Co packaging. Always guaranteed 100% genuine brand! Estate jewelry, which by definition means previously owned. All designer, signed, vintage, retro, estate, antique, fine, fashion, and or trademarked jewelry is pre-owned and pre-loved therefore signs of wear may show, which is consistent with use and age unless described as MINT condition. For example slight scuffing on band, worn down hallmarks, etc. Our pictures are a visual description of the piece you are bidding on. We always make our best effort to state the maker, branded name, trademarked company info, etc. In some cases we will refer to the piece as designer signed and reference the maker; such as T & Co (Tiffany & Co), Cartier, Yurman, Brighton etc. when applicable.